I am making a list of geometry theorems and sorting them by the geometry they presume. Wikipedia list of geometry topics has a long list of geometries. It also lists various transformations, symmetries and concepts. Difference between stating a proof (final copy) as an element of a monoid, where no step is taken back, and exploratory thinking (rough draft) where ideas (suppositions) can be thought and rethought or even unthought. Compare with types of poems! Thomsen's theorem shows that a certain path constructed by line segments being parallel to the edges of a triangle always ends up at its starting point. Binomial, multinomial theorems, counting paths - Young lattices, Gaussian coefficients, infinite family of simplexes. (Converse of Thales' theorem): The perpendicular bisectors of any two sides of a triangle intersect in exactly one point. Thus there is a circle containing all three vertices of the triangle. De Bruijn–Erdős theorem (incidence geometry) states a lower bound on the number of lines determined by n points in a projective plane. By duality, this is also a bound on the number of intersection points determined by a configuration of lines. Pappus's hexagon theorem states that given one set of collinear points A, B, C, and another set of collinear points a, b, c, then the intersection points X, Y, Z of line pairs Ab and aB, Ac and aC, Bc and bC are collinear, lying on the Pappus line. Desargues' theorem states that two triangles are in perspective axially if and only if they are in perspective centrally. the Beckman–Quarles theorem, named after F. S. Beckman and D. A. Quarles, Jr., states that if a transformation of the Euclidean plane or a higher-dimensional Euclidean space preserves unit distances, then it preserves all distances. Equivalently, every automorphism of the unit distance graph of the plane must be an isometry of the plane. Cayley–Bacharach theorem is a statement about cubic curves (plane curves of degree three) in the projective plane P2. The original form states: Assume that two cubics C1 and C2 in the projective plane meet in nine (different) points, as they do in general over an algebraically closed field. Then every cubic that passes through any eight of the points also passes through the ninth point. Bruck–Ryser–Chowla theorem is a result on the combinatorics of block designs. In the special case of a symmetric design with λ = 1, it says that if a finite projective plane of order q exists and q is congruent to 1 or 2 (mod 4), then q must be the sum of two squares. 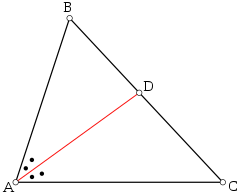 Veblen-Young theorem states that if the dimension of a projective space is at least 3 (meaning that there are two non-intersecting lines) then the projective space is isomorphic with the projective space of lines in a vector space over some division ring K.
Building (mathematics) is a combinatorial and geometric structure which simultaneously generalizes certain aspects of flag manifolds, finite projective planes, and Riemannian symmetric spaces. Exterior angle theorem states that the measure of an exterior angle of a triangle is greater than either of the measures of the remote interior angles. Steiner-Lehmus theorem states that every triangle with two angle bisectors of equal lengths is isosceles. Thales' theorem states that if A, B and C are points on a circle where the line AC is a diameter of the circle, then the angle ∠ABC is a right angle. Pitot theorem states that in a tangential quadrilateral the two sums of lengths of opposite sides are the same. It makes use of the fact that two tangent line segments from a point outside the circle to the circle have equal lengths. The four corners define pairs of lengths whose corresponding vectors can be reorganized in the vector geometry. Angle bisector theorem is concerned with the relative lengths of the two segments that a triangle's side is divided into by a line that bisects the opposite angle. It equates their relative lengths to the relative lengths of the other two sides of the triangle. Ceva's theorem relates a triangle with three concurrent lines (cevians). The cevians proportion the triangle's sides so that, going around in a circle, the product equals 1. Equal incircles theorem states that given equal circles inscribed by rays, the circles inscribed by every Nth ray are also equal. Intercept theorem concerns the ratios of various line segments that are created if two intersecting lines are intercepted by a pair of parallels. It is equivalent to the theorem about ratios in similar triangles. Law of sines relates the lengths of the sides of any shaped triangle to the sines of its angles. Brocard points are isogonal conjugate points such that, in counterclockwise order, the line segments AP, BP, CP form the same angle. Triangle centers are points that are in some sense the center of a triangle. Inscribed angle theorem states that an angle θ inscribed in a circle is half of the central angle 2θ that subtends the same arc on the circle. Bézout's theorem is a statement in algebraic geometry concerning the number of common points, or intersection points, of two plane algebraic curves, which do not share a common component (that is, which do not have infinitely many common points). The theorem claims that the number of common points of two such curves is at most equal to the product of their degrees, and equality holds if one counts points at infinity, points with complex coordinates (or more generally, coordinates from the algebraic closure of the ground field), and if each point is counted with its intersection multiplicity. Napoleon points are points of concurrence related to three equilateral triangles whose sides form a triangle. Pascal's theorem states that if six arbitrary points are chosen on a conic (i.e., ellipse, parabola or hyperbola) and joined by line segments in any order to form a hexagon, then the three pairs of opposite sides of the hexagon (extended if necessary) meet in three points which lie on a straight line, called the Pascal line of the hexagon. Euler line, given an equilateral triangle, passes through the centroid, orthocenter, circumcenter and the center of the nine-point circle. Kiefart hyperbola is the unique conic which passes through a triangle's three vertices, its orthocenter and centroid. Lester's theorem states that in any scalene triangle, the two Fermat points, the nine-point center, and the circumcenter lie on the same circle. Nine-point conice of a complete quadrangle is a conic that passes through the three diagonal points and the six midpoints of sides of the complete quadrangle. Nine-point circle contains the midpoint of each side of a triangle, the foot of each altitude, and the midpoint of the line segment from each vertex of the triangle to the orthocenter (where the three altitudes meet). Steiner conic is an alternative method to define a non-degenerate projective conic section in a projective plane over a field. Segre's theorem states that any oval in a finite pappian projective plane of odd order is a nondegenerate projective conic section. Qvist's theorem explains how many tangents to an oval can pass through a point in a finite projective plane. Miquel's theorem concerns the intersection of three circles, each drawn through one vertex of a triangle and two points on its adjacent sides. It follows from the properties of the angles of two cyclic quadrilaterals drawn from any two of a triangle's vertices, having an edge in common as shown in the figure. Clifford's circle theorems constructs additional circles from subsets of circles passing through a common point. Six circles theorem relates to a chain of six circles together with a triangle, such that each circle is tangent to two sides of the triangle and also to the preceding circle in the chain. The chain closes, in the sense that the sixth circle is always tangent to the first circle. Seven circles theorem says that given a chain of six circles all tangent to a seventh circle and each tangent to its two neighbors, the three lines drawn between opposite pairs of the points of tangency on the seventh circle all pass through the same point. A proof based on Ceva's theorem, proportions. Napoleon's theorem states that if equilateral triangles are constructed on the sides of any triangle, either all outward or all inward, the centres of those equilateral triangles themselves form an equilateral triangle. Morley's trisector theorem states that in any triangle, the three points of intersection of the adjacent angle trisectors form an equilateral triangle. Pompeiu's theorem states that given an equilateral triangle ABC in the plane, and a point P in the plane of the triangle ABC, the lengths PA, PB, and PC form the sides of a (maybe, degenerate) triangle. Pons asinorum states that the angles opposite the equal sides of an isosceles triangle are themselves equal. Japanese theorem for cyclic quadrilaterals states that the centers of the incircles of certain triangles inside a cyclic quadrilateral are vertices of a rectangle. A proof in terms of angles. the 2π theorem of Gromov and Thurston states a sufficient condition for Dehn filling on a cusped hyperbolic 3-manifold to result in a negatively curved 3-manifold. Abouabdillah's theorem states that every injective or surjective transformation of a Euclidean space that preserves circles or spheres is a similarity. Barbier's theorem states that every curve of constant width has perimeter π times its width, regardless of its precise shape. Brahmagupta's formula finds the area of any cyclic quadrilateral (one that can be inscribed in a circle) given the lengths of the sides. Anderson's theorem is a result in real analysis and geometry which says that the integral of an integrable, symmetric, unimodal, non-negative function f over an n-dimensional convex body K does not decrease if K is translated inwards towards the origin. Blaschke–Lebesgue theorem states that the Reuleaux triangle has the least area of all curves of given constant width. Pythagorean theorem states that the square of a hypotenuse is equal to the sum of the squares of the other two sides of a right triangle. Pappus's area theorem generalizes the Pythagorean theorem by showing how, given any triangle, and parallelograms on two sides, we can construct a parallelogram with the combined area of the other two. Parallelogram law states that the sum of the squares of the lengths of the four sides of a parallelogram equals the sum of the squares of the lengths of the two diagonals. Stewart's theorem yields a relation between the lengths of the sides of the triangle and the length of a cevian of the triangle. Apollonius' theorem relates the length of a median of a triangle to the lengths of its sides. British flag theorem says that if a point P is chosen inside rectangle ABCD then the sum of the squared Euclidean distances from P to two opposite corners of the rectangle equals the sum to the other two opposite corners. Japanese theorem for cyclic polygons states that no matter how one triangulates a cyclic polygon, the sum of inradii of triangles is constant. It follows from Carnot's theorem. Geometric mean theorem equates the square of the length of the altitude on the hypotenuse in a right triangle and the product of the two line segments it creates on the hypotenuse. Heron's formula gives the area of a triangle. Ptolemy's theorem relates the four sides and two diagonals of a cyclic quadrilateral. Casey's theorem generalizes Ptolemy's theorem. It relates tangents to four non-intersecting circles that lie inside a circle and are tangent to it. Feuerbach's theorem states that the nine-point circle is tangent (at the Feuerbach point) to the incircle and excircles of a triangle. Law of cosines relates the lengths of the sides of a triangle to the cosine of one of its angles. Napoleon's area theorem The difference in area of the outer and inner Napoleon triangles equals the area of the original triangle. Pizza theorem shows that, if a pizza is sliced in a multiple of four slices, and two people share it by taking alternating slices, then they each get an equal amount of pizza. Gerbaldi's theorem states that one can find six pairwise apolar linearly independent nondegenerate ternary quadratic forms. These are permuted by the Valentiner group. Bernstein–Kushnirenko theorem claims that the number of non-zero complex solutions of a system of Laurent polynomial equations f1 = 0, ..., fn = 0 is equal to the mixed volume of the Newton polytopes of f1, ..., fn, assuming that all non-zero coefficients of fn are generic. Birkhoff–Grothendieck theorem classifies holomorphic vector bundles over the complex projective line. In particular every holomorphic vector bundle over CP1 is a direct sum of holomorphic line bundles. The probability distribution of a simplex (equilateral triangle) - the center must be 1/n. This same results holds for my arbitrary triangle and its center.